We started a tradition of growing our own Easter basket grass from wheat berries about six years ago. I hate plastic Easter grass and needed an eco-friendly alternative. We had been using shredded green paper but this real Easter grass (AKA wheatgrass) is super easy to grow in about seven days. The best part? When you are done with Easter, the wheatgrass is edible! To eat the wheatgrass, blend it into smoothie, run it through your juicer or feed it to your pet rabbit or chickens! 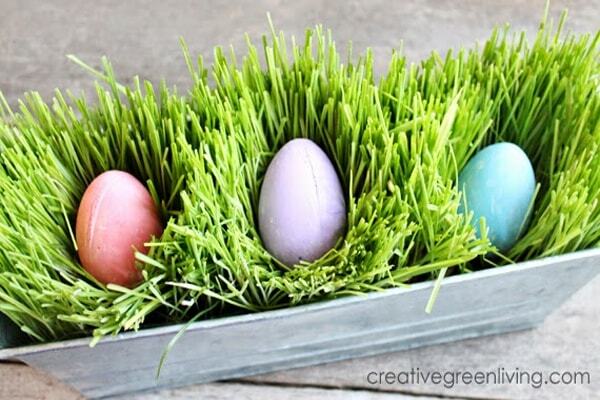 Growing wheatgrass is really easy and makes your Easter baskets look extra fancy. Plus there's no waste, so it's an eco-friendly win all around! Hi friends, it's Natalie from Doodlecraft sharing a fun paint marbling craft! Marbled Easter eggs make stunning Easter decor and are simple to make! The results you get from learning how to do a marbling technique are amazing and a surprise each time. It's a great craft for any skill level--beginners to advance crafters will love to marble a dozen or more eggs. Dying Easter eggs is something my family loves to do every year. My kids and I don't eat artificial food coloring, though, so it doesn't make sense to dye Easter eggs with a product that will mean we won't want to eat the eggs anymore! Dying Easter eggs naturally isn't hard - although it does take a little bit more time than dying eggs with the kits from the store. Try coloring your Easter eggs naturally this year with fruits, veggies, spice and even coffee! You and your kids will love how much fun it is to combine science with Easter egg decorating! Making natural Easter egg dyes is easy and you will love thinking up new ways to dye eggs that I didn't even list here! 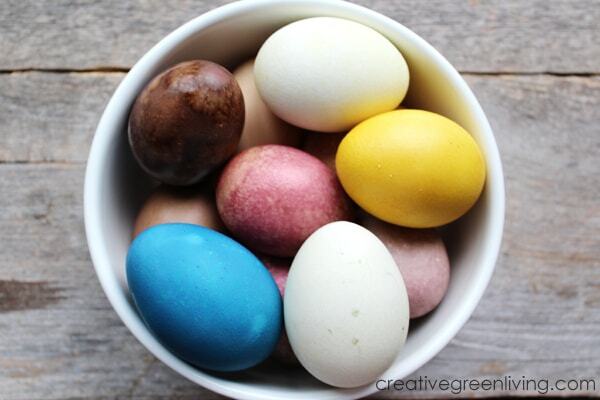 If you have success with a particular way to dye eggs naturally, pop into the Creative Green Living Tribe on Facebook and let us know! Need gifts for a little boy in your life? If you are on the hunt for a great gift for your favorite four year old boy, I've got your back! What is a good toy for a 4 year old boy? Gifts recommended by Creative Green Living inspire imaginative play, teach or meet a need in a fun way. Of course many of these gifts make great girl gifts as well (no gender discrimination here!). I have a good mix of toys you can buy on Amazon as well as DIY gift ideas that you can make yourself. Have you ever wondered what the true cost of all the gifts from the 12 Days of Christmas would be? Today I am partnering with PNC to bring you this post and the 2018 PNC Christmas Price Index® to help you find out! 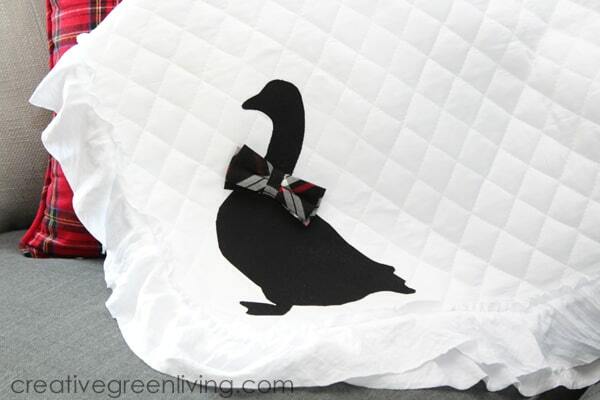 This year, PNC is also partnering with bloggers to bring you modern takes on the classic 12 Days of Christmas gifts. Christmas gift hunting mode in in full effect and now you need killer stocking stuffer ideas for kids! Whether you are stuffing a stocking for a guy or gal, I've got more than 50 ideas they are sure to love! These are the best stocking stuffers for kids. This entire list is 100% kiddo approved! Both my eight year old and four year old helped me find gifts to put in this guide that both they and their friends would love! There are lots of great stocking stuffer ideas for boys and girls. 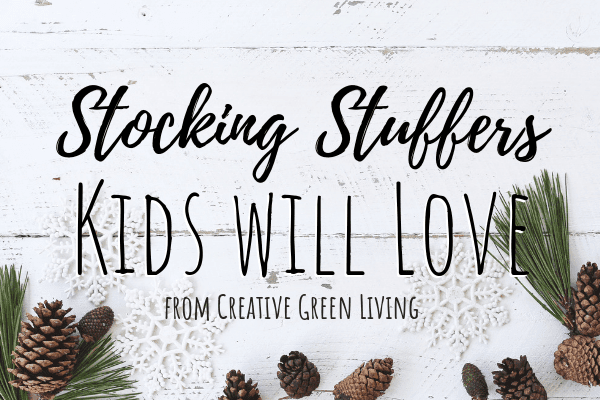 If you want the absolute best stocking stuffer ideas for kids, I've got them right here! Tons of suggestions for her or for him. Whether your kids love cats, Minecraft, unicorns, of whatever! There is something for everyone you are shopping for! This stocking stuffer gift guide is designed for elementary age kids from kindergarten, through tweens and into early teen years. Have you been racking your brain trying to find tween gift ideas? Your daughter, friend or niece is the creative type. She sews, doodles, makes friendship bracelets, knits, crochets, adores washi tape and glitter - or maybe she just aspires to those things. 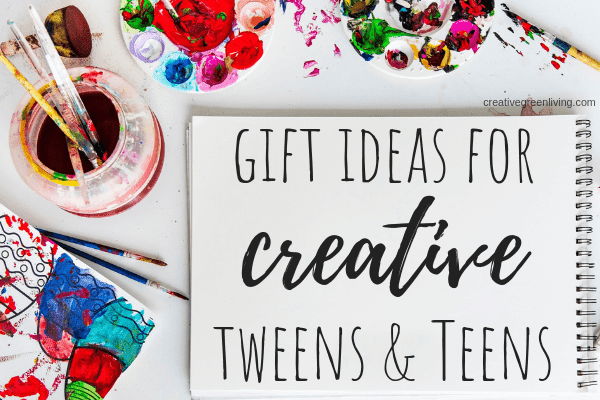 If you know a creative girl in her tweens or early teens, she will love all of these gift ideas! Whether you need a crafty birthday gift idea or something to put under the Christmas tree, all of these creative gift ideas will have her making and creating instead of getting sucked into screen time. Whatever her favorite crafting medium is, here are the best gift ideas that every crafty teen or tween is sure to love! Doing last minute shopping? Use Amazon Prime and their free two day shipping! Click the banner below to sign up for a FREE 30 day trial of Amazon Prime and get all your last minute gift shopping done online - with free shipping! (Need a gift for someone else? From four year old boys to dads, I've got a gift guide to help you find the perfect gift for anyone! This gift guide contains both affiliate links and sponsored placements. If you are trying to find worthwhile stocking stuffers for your wife, girlfriend or adult daughters, you are in the right place! Finding stocking stuffers for the women in your life can feel overwhelming, but it doesn't have to be! She may even end up loving the stuff you put in her stocking more than what's under the tree! 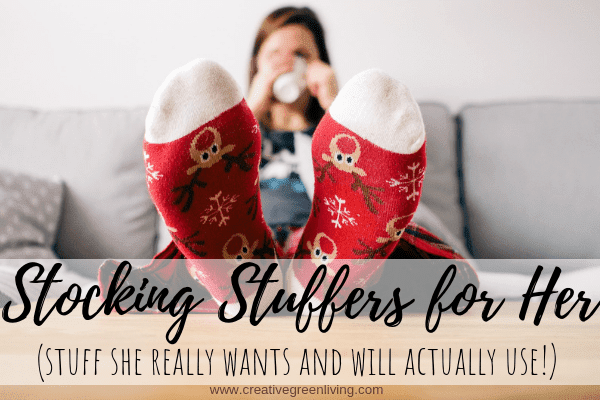 If you have been scratching your head about what kind of stocking stuffers to get for your wife, girlfriend or daughter, here are some of my favorite suggestions. Do you totally regret getting your kids an Elf on the Shelf? Are you trying to figure out how to stop doing Elf on the Shelf shennanigans and send your elf packing? Need to reclaim your time? This is the post for you! If you've been asking yourself when will this elf on a shelf leave??? 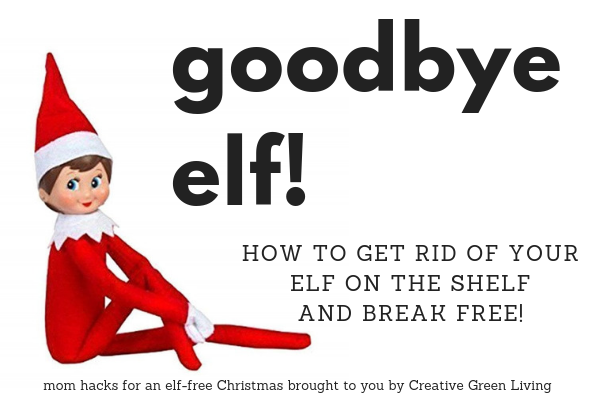 pretty much as soon as you've gotten him or her out for the year, you may be experiencing Elf Regret. Don't worry, it happens to the best of us. You heard of elf on a shelf. Maybe the kids' friends have one. You think why not. You adopt the elf. Take it home. Name it. Everything is fine and dandy until you realize that now your elf needs to do things. Which of course means you need to figure out what to make the elf do. The next thing you know, you find yourself constructing elaborate scenes for your elf. You're up late in bed Googling 101 elf on the shelf ideas. You get tired of messy elf mischief and move on to trying to find easy and quick elf on the shelf ideas. But then you hit the point where you are totally over it and just start wondering when is this elf-ing elf going to leave??? Don't worry. I've got your back. Mamas have to stick together. This post contains affiliate links and sponsored placements. In many families, long past the time they give Christmas gifts from Santa, adults still get stuffed stockings on Christmas morning. Of course, filling Christmas stockings for adults can be a little trickier than filling stockings for kids. Anyone can buy cheap toys or plastic doo-dads at the Dollar Store but what kinds of things will they actually use? 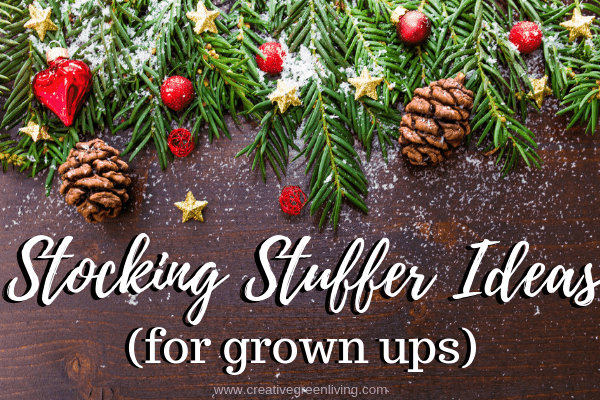 If you are looking to find great stocking stuffer ideas for your adult children, stocking stuffers for your wife or husband, I've got lots of ideas for you! This list has great stocking stuffers for men, stocking stuffers for her, stocking stuffers under $5 and, consumable stocking stuffers and extra special stocking stuffers that are a little more. Of course, because we're Creative Green Living, our primary focus isn't going to be on plastic toys or cheap trinkets that will break quickly or things that will wind up in the landfill in a week. What are great stocking stuffer ideas? These are my best ideas to help you fill their stockings with great gifts that meet those criteria! The last thing most of us need is "stuff." I love things that I can really use (and even better, use UP). Just say no to cheap junk and give gifts they will love and can use. Ready to get all my best stocking stuffer ideas for adults? Let's go! 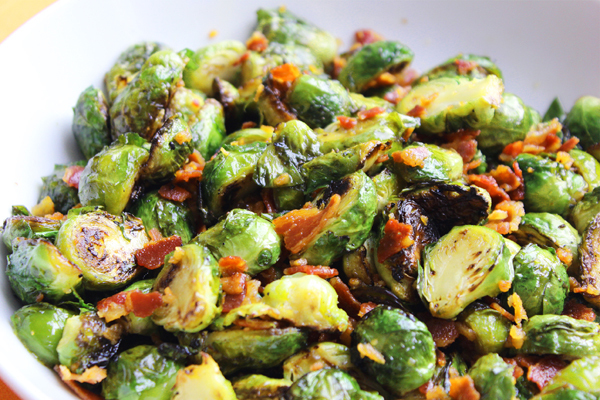 If you need a gluten free stuffing recipe, you're in the right place! This gluten free stuffing recipe with sausage is so good that nobody will know its gluten free unless you tell them! This stuffing is perfect for turkey stuffing or just baking on the side as-is (but way tastier than the stuff from Stove Top!). Whether you need GF stuffing for Thanksgiving, Christmas or just because this recipe will be a hit with everyone! 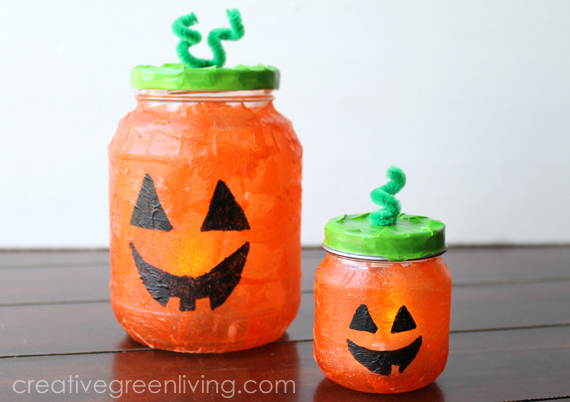 If you're looking for an easy Halloween craft to do with kids, look no further than your recycling bin! With a little help from Mod Podge and tissue paper (or napkins) you can transform empty glass jars to adorable Halloween luminaries. 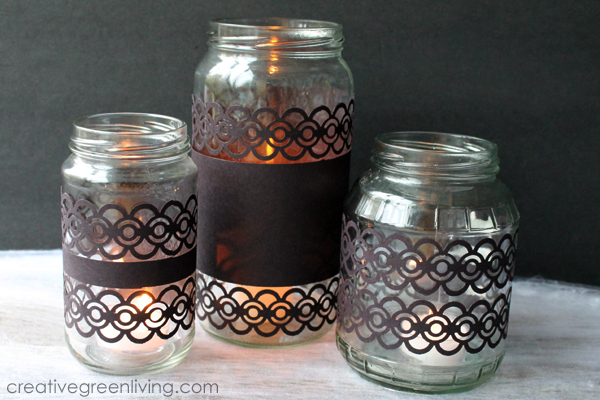 These recycled glass jar luminaries are easy to make and a perfect first Mod Podge project. This Halloween luminary project I designed was featured on Hands on Crafts for Kids in December of 2015. While the version of my Halloween luminaries aired by Hands on Crafts for Kids is a little different than the way I designed it (they used Elmer's glue instead of Mod Podge for example), watching the video below will give you the basic technique for making them. If you want to learn how to make a DIY crown or tiara, you're in the right place! Whether you want to make a craft to feel fancy while watching the royal wedding, need something for International Tiara Day or just need a birthday crown for your favorite adult or child, I've got you covered! You want to make a paper crown? Got it! Mermaid crown with seashells? You better believe it! Just choose your favorite style of crown below and click the picture to learn how to make it! All of these crowns have a helpful tutorial that will show you how to make one for yourself. 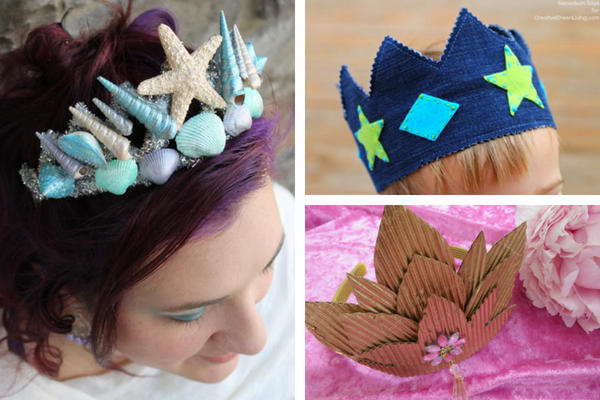 If you have dreams of being a mer-princess, this beautiful mermaid crown is for you! 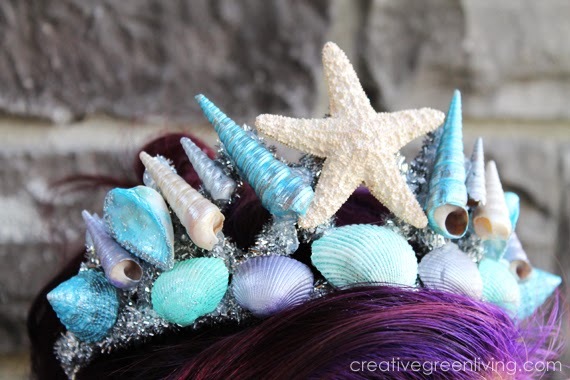 Every mermaid princess needs a spectacular seashell crown to top their long flowing hair. This DIY headpiece isn't hard to make and will be sure to impress whether you are partying at a festival or trick or treating for Halloween. I originally designed this mermaid crown to be part of little girl's mermaid Halloween costume (full mermaid costume tutorial here) but it is definitely sophisticated enough for the adult mermaid as pictured. If you use my tutorial to create your own mermaid crown, let me know! Share a picture in the Creative Green Living Tribe or tag me on Instagram. If you are looking for healthy Easter basket ideas, you have come to the right place! When my oldest was just a toddler, we realized that finding healthy Easter treats was hard. There was so much candy and artificial food dye everywhere at Easter time! Luckily, making these healthy Easter treats is super easy and my kids love them! 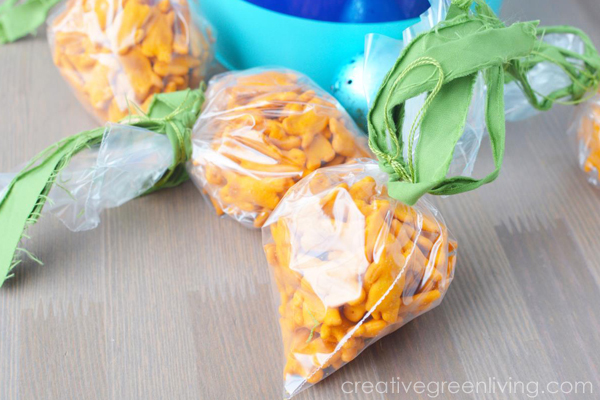 Even my second grade boy still loves eating these cheddar bunny crackers - so this healthy Easter basket idea is perfect for toddlers and big kids alike! 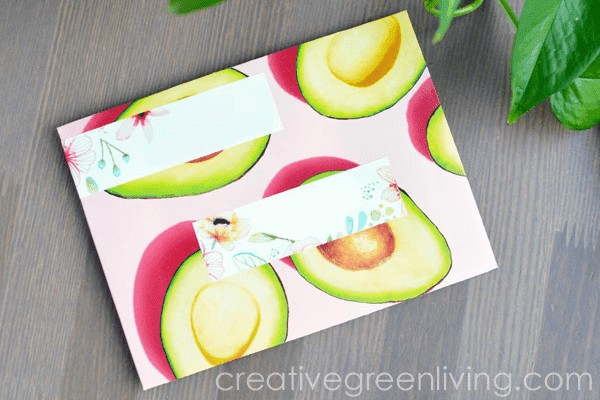 While envelopes aren't exactly expensive, making envelopes out of paper - like scrapbook paper, junk mail or magazines - is a fun way to recycle and get super cute envelopes at the same time! This sample envelope, for example, was made from the paper cover of Real Simple magazine. Beautiful! Once you learn how to make an envelope, you'll want to do it all the time! There is no better way to make your mail stand out and feel special than sending it in a cool envelope. Making envelopes from paper is easy enough that elementary age kids, preteens and teens can do it as a fun rainy day project. And who wouldn't love to get mail in a special, custom made envelope? 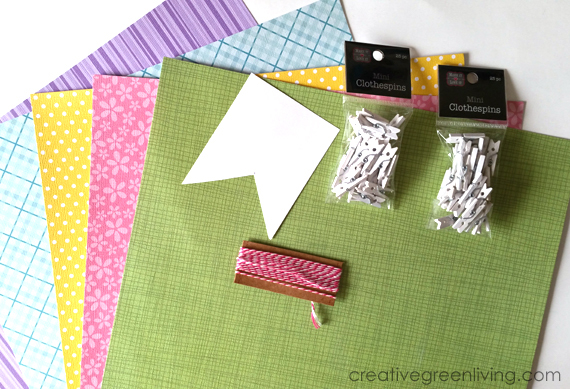 Ready to learn how to make envelopes out of paper you have at home? Let's do it! If you're looking for a great Valentine's Day Star Wars craft, you will love these punny and porg inspired Valentine's Day cards! Hi Creative Green Living crafters, it's Natalie from Doodlecraft. Do the Porgs from Star Wars: The Last Jedi have your heart too? They are adorable! They are kind of a mix between a penguin and a Kawaii cartoon. Now you can make a huddle, colony or raft of colorful Star Wars inspired Porg Valentine cards. These are the perfect porg craft for kids. Carissa and I even put together a free printable for you to make this project even easier! Christmas mornings at our house are filled with lots of LEGO sets, making the joys of Christmas last longer as we put them together. I know I'm not alone! No wonder LEGO and Christmas just seem to go hand in hand for so many families. Lego Christmas ornaments are perfect for the days leading up to Christmas. Maybe you need to keep little hands busy when they are home from school or just want unique ornaments on your tree. Unlike many store bought ornaments, LEGO ornaments will be lead free (yay!) and zero waste because when you are done, the LEGOs just go back in their bin to play with later instead of languishing in storage. I love that you can make LEGO ornaments of anything you can imagine - everything from LEGO Star Wars ornaments to simple classics like LEGO Christmas trees and candy canes. If you're ready to get your LEGO Christmas mojo going, here are 15 awesome LEGO Christmas ornament tutorials to get your creative juices flowing! The Star Wars episode 8 countdown is on! If you haven't already fallen in love with the porgs through the Star Wars previews, you surely will after watching the movie! The adorable porgs are native to the planet Ahch-To, where Luke has exiled himself - and I basically just want to snuggle one. While you can't adopt a real life porg, getting a porg Christmas ornament may be the next best thing! 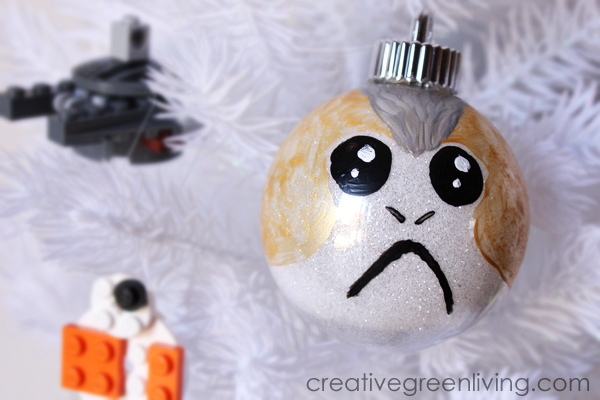 Read on to learn how to transform a humble ball ornament into an adorable porg Christmas ornament. 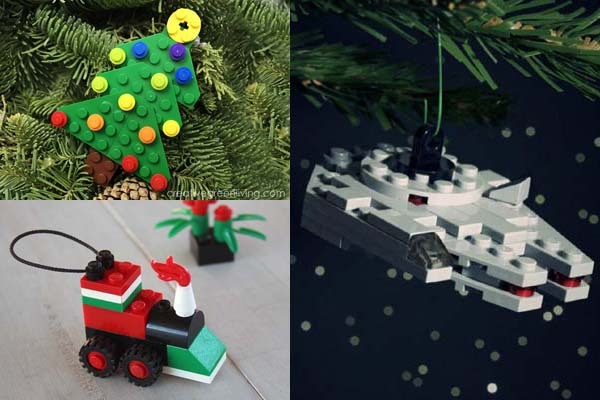 If you have LEGOs, you have all the materials you need to make awesome Christmas ornaments! This LEGO candy cane Christmas ornament is easy to make. Unlike many store bought Christmas ornaments, it's lead free! 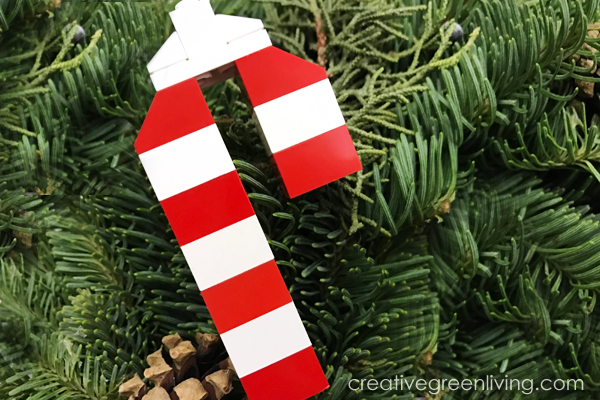 Your little LEGO builders will have lots of fun building a small army of candy canes for your tree. LEGO Christmas ornaments are also great because after Christmas, you can take them apart and keep using them the rest of the year - unlike glass balls that take up space in your garage or attic 11 months out of the year. This LEGO candy cane was designed by my seven year old son who wants to be a LEGO master builder when he grows up. He has also started dabbling in LEGO stop motion animations and helped me make the video that appears below! If you can't tell, I'm a pretty proud of him. This DIY LEGO ornament is really easy to make. Stacking the red and white pieces together is great pattern practice for little one but big ones will catch on quickly. Once you have finished building your LEGO candy cane, thread a string through hole at the top and hang it on your tree! The LEGOs snap together really securely so they don't need glue unless you want to make the candy cane arrangement permanent. Do you love llamas? 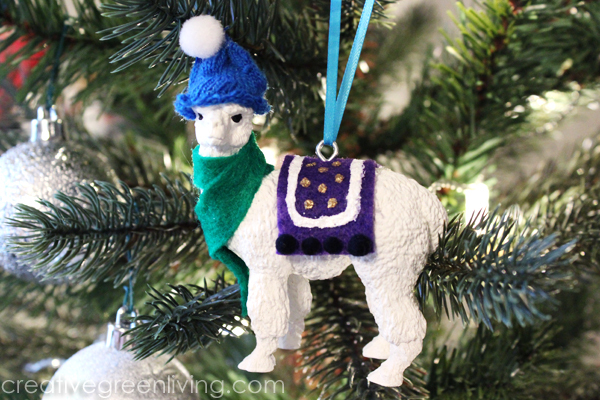 Llamas are super trendy for Christmas this year but some of my favorite blogger friends and I noticed there weren't many DIY llama ornament tutorials already on the internet so today we changed that! If you asked Santa for a llama for Christmas, we are here to deliver! For my llama ornament, I made a baby llama with a hat, a scarf and adorned blanket. Be sure to keep scrolling below my tutorial to see more llama ornament pictures and get the links to the tutorials from my friends! If you love llamas you could end up with an entire Christmas llama menagerie! If you have a LEGO lover in your house, you probably have a whole bin full (or a floor full?) of LEGOs that you can use to build your own DIY ornaments! LEGO Christmas ornaments are fun and eco friendly because after Christmas, you can take them apart you can keep using them the rest of the year - unlike the glass balls that take up space in your garage or attic 11 months out of the year. This LEGO Christmas tree was kid-designed by my seven year old son who wants to be a LEGO master builder when he grows up. He has also started dabbling in LEGO stop motion animations and helped me make the video that appears below! If you can't tell, I'm a pretty proud mama. 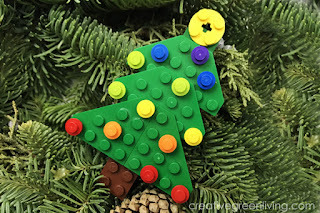 This DIY LEGO ornament is really easy to make. We used a rainbow of different studs for the ornaments but you can use whatever color studs you happen to have to decorate your LEGO Christmas tree. The translucent studs would make a great option as well because they look like glass ornaments or lights. 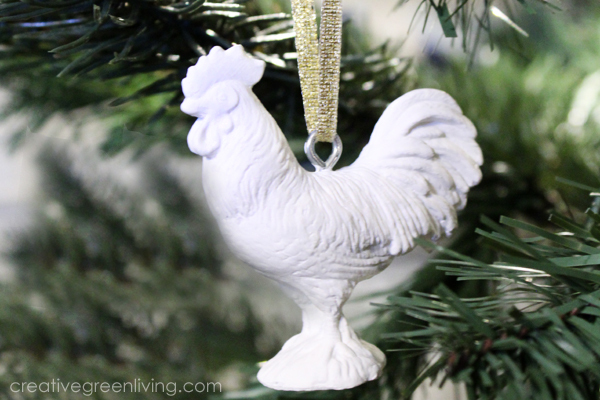 If you love chickens, you will love this super easy DIY chicken Christmas ornament! Even though it is actually made from a rubber child's toy, it has the look of a ceramic ornament but without all the extra weight. Of course, you can make any rubber animal into an ornament - you could make a whole barnyard tree if you wanted to! Or make it as a gift for your favorite chicken lover. 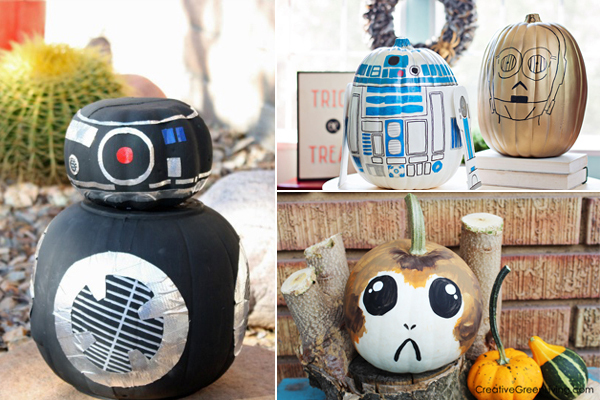 12 DIY Star Wars Halloween Pumpkins That Will Blow Your Mind! If you love Star Wars like we do then you will LOVE these Halloween pumpkins and jack-o-lanterns! Whether you like painting, carving or decorating, there's a pumpkin here for you! Whether you love porgs, droids, the dark side, the death star, C3PO, R2D2 and more - there's a pumpkin for you! These 12 DIY Star Wars pumpkin tutorials are sure to get you in the Halloween spirit as you decorate your front porch for Halloween in true geek chic fashion. Hi friends, it's Natalie from Doodlecraft! With Star Wars The Last Jedi trailers and other spoilers released, we are privy to an adorable new creature that will appear in the next episode: Porgs. From the planet Ahch-To, porgs are modeled after puffins and are so cute with their little frowny faces. It's easy to make a porg jack-o-lantern for Halloween using paint and either a real pumpkin or a craft pumpkin (craft pumpkins are great because you can re-use the same pumpkin next year!). Let me show you how to make an adorable porg pumpkin craft to set out on your porch for Halloween! 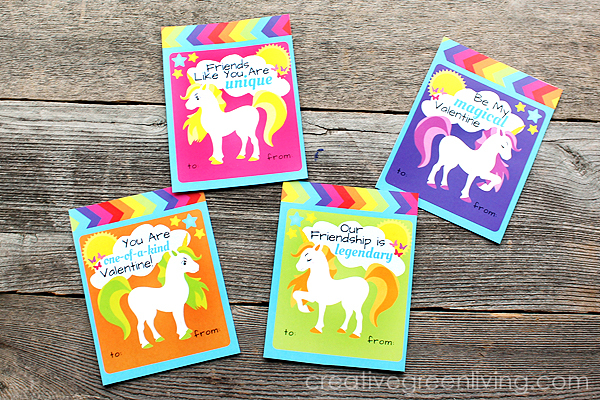 Free Printable Rainbow Unicorn Valentines! 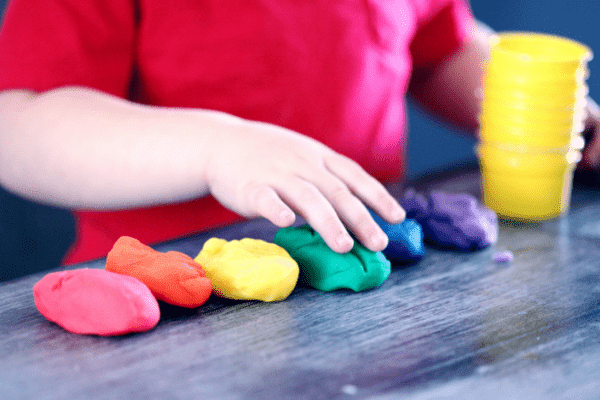 Do you and your kids love unicorns and rainbows? Us, too! This year for Valentine's Day I had these beautiful unicorn valentines designed as a special bonus for Creative Green Living readers! Since there are so many male unicorn lovers and bronies out there, I specifically had them designed to use a variety of colors to appeal to everyone. Last year my Christmas decorating was really limited to having a tree and doing up my mantel. 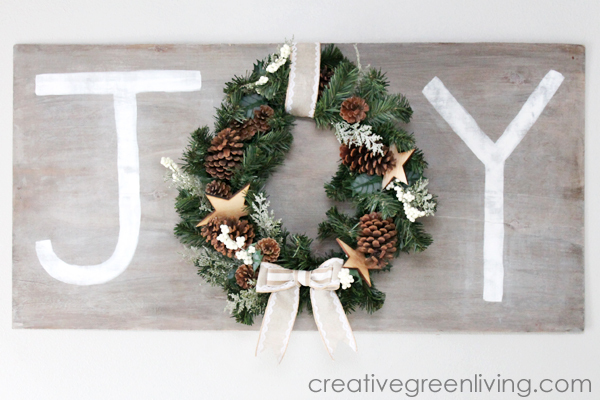 This year, I expanded my holiday decor to match my modern farmhouse look and set up a few new things including this JOY sign. I have a massive wall behind my couch which needed a large decor piece and this worked perfectly. I didn't happen to have any huge pieces of barnwood on hand so I used a faux barnwood treatment to get it to look like old barn wood or a pallet and paired it with milk painted letters and a pretty wreath. Even though my finished piece is 24" x 48" this whole project scales up or down beautifully to be any size you need for your space. One of my favorite Christmas traditions is to make ornaments with our kids throughout the month of December. I love having new ornaments made by little hands every year. Kid-made ornaments are like mini time capsules that bring you back to a snapshot in time. I never understood why my mom kept using the "ugly", ratty ornaments we made as small children even into my teens - until I became a mom. I love those little sloppily painted, crooked, wonky ornaments so so so much. 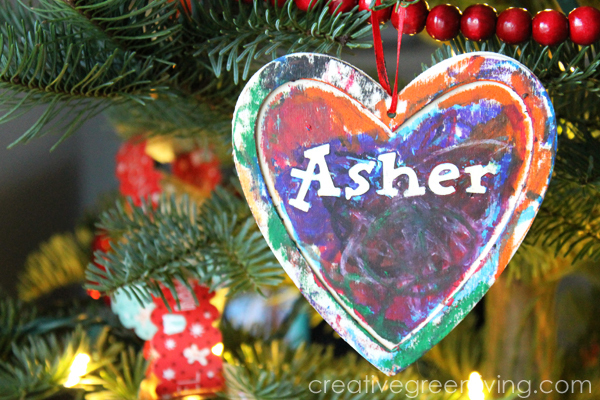 This year, we did personalized wood ornaments with the kids. These are easy enough that any baby big enough to scribble with crayons can make them but big kids will still have fun, too. Make a few for your tree but don't forget the grandparents - they will love these sweet little scribbly ornaments, as well! 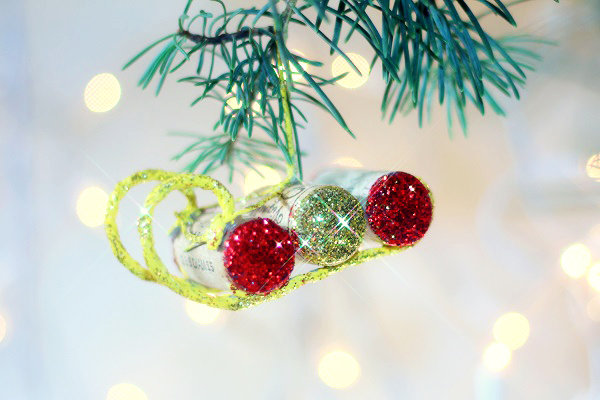 Have you been hoarding wine corks because you're sure that you'll do a craft with them some day? Well "some day" has arrived my friends - Tata from EggoMache is here to do a special guest tutorial teaching you how to make an adorable sled ornament with wine corks! If you're not feeling terribly crafty at the moment, you could also buy one straight from the EggoMache etsy shop here and support an artist turning trash into beautiful treasures. Enjoy! I have always had a soft spot in my heart for hot cocoa. My mom used to make it for us on cold winter nights, and would always tell us how when she was a teenager, her dad (my grandpa), would get up with her before school and make her hot cocoa and cornbread on cold winter mornings. I think the world would be a better place if more dads made hot cocoa for their kids on cold mornings, don't you? 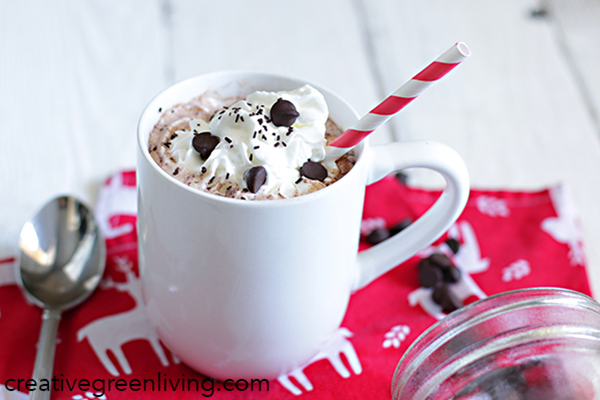 This delicious hot cocoa is not the recipe my grandpa used, but it is rich and sweet, with a light peppermint flavor to make it a little extra special for the Holiday season. It will be perfect for Santa on Christmas Eve, a holiday party or a cold winter morning with your family. This post is brought to you by Cost Plus World Market. Have you seen those big red boxes of the Italian fruitcake, Panettone, at Christmas time and wondered what to do with it? I have a delightful recipe for Panettone French toast that is perfect for breakfast or brunch on Christmas morning! 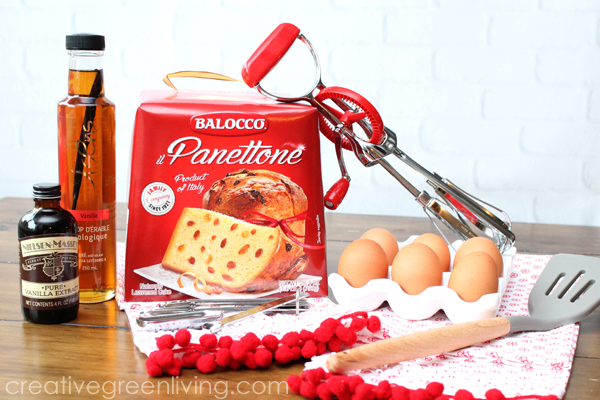 One of my favorite Christmas recipes is Panettone French Toast. Panettone is a traditional Italian bread filled with raisins, candied orange peel and other fruits and it is delicious. This year, Cost Plus World Market asked me to partner with them to show off the recipe - so it's up over on the official World Market blog this week as we focus on Christmas traditions from around the world! My wonderful Italian grandmother excelled at traditional recipes but wasn't afraid to experiment with new things either. This French toast is a fun twist on the traditional Italian Christmas bread - and something I think Grandma would approve of! I've talked before about my large glass jar collection. 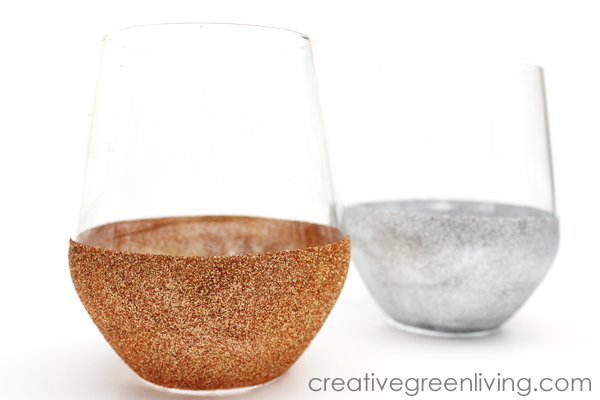 Not only are glass jars great for holding leftovers, but they make a great craft medium as well. (see all my projects using glass jars here!). For this project, you can transform empty glass jars into lacey votive candle holders in less than 15 minutes with just a handful of supplies. 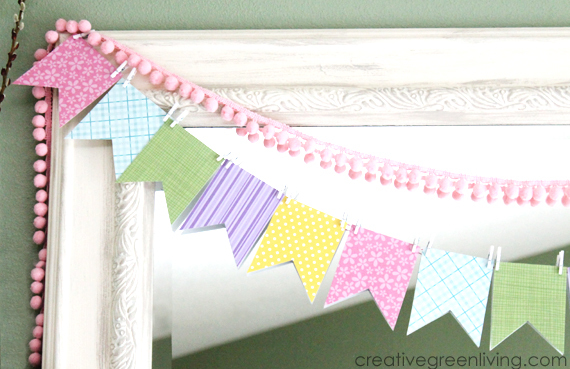 Do you need an easy, last minute Easter decoration? This Easter decor craft is super easy and took less than half an hour to put together! It was the perfect addition to our Easter mantle decor above our fireplace. Also, because you only need a few small pieces of each type of cardstock, this is a great way to use up paper scraps from scrapbooking or card making if you have them!